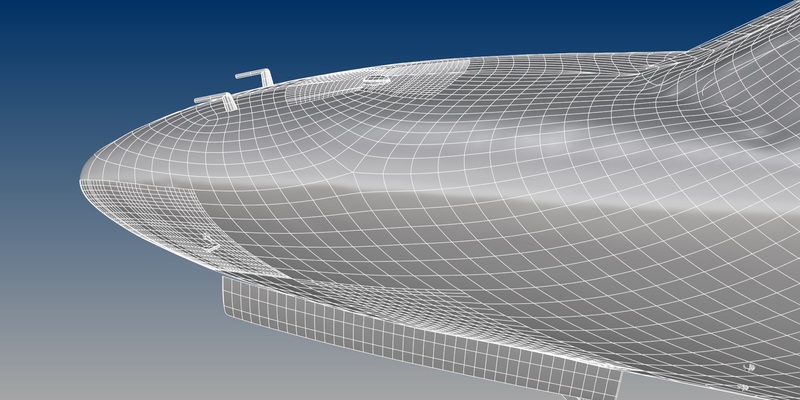 The vast majority of the nose is one single surface, and the entire thing is watertight, so that it can be imported into the customer’s CFD package without any further work. Using the laser scanned data and photos of the actual aircraft, we were able to give the windshield and windows the proper shape. There are no strange lumpy defects, and the isocurves are aligned in a way that actually make sense. 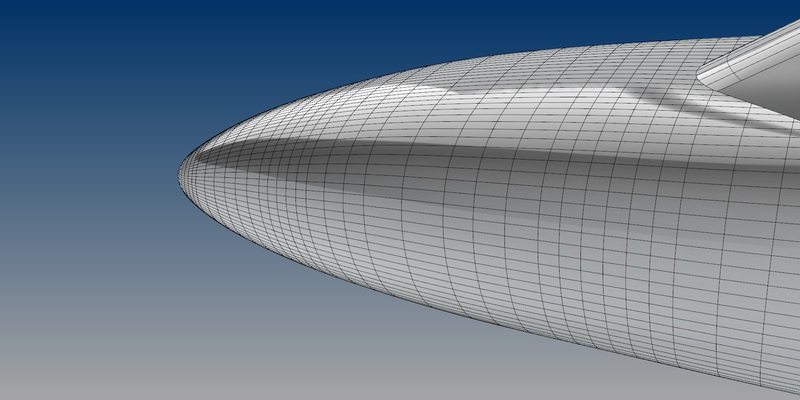 In the overall scheme of things, an aircraft nose is really not a complicated shape. It’s quite telling that a reverse engineering software package does such a poor job of making what is frankly not the most taxing of tasks. From what we’ve seen, this is the rule and not the exception when it comes to shapes like these with reverse engineering software. Did it take longer to do this from scratch? Probably, we can’t know for sure, since we didn’t make the first surface model. But, we’re not exactly comparing apples to apples here, since the original surface model was not actually usable by the customer, so it’s like saying “we could do this faster if we deliver something that’s totally useless and causes you nothing but frustration.” We take pride in our work and we like to make our customer’s lives easier, and so we take the time to do it right, and build our models from scratch. Good to see you back up on line, I have a lot of experience with high end scanning packages and I agree with you, Rhino, Rhino Reverse and T splines are fantastic your T spline Utube are awesome. Welcome back Sky. Glad you’re back! Can you tell us what CFD package would be next in this workflow? Thanks. David – No clue, other than to say I know the cost of these systems tends to be in the 10’s of thousands per year for a seat. Great article and good to hear from you again Sky. I wonder how long it will be until Autodesk buys Rhino as they seem to have bought up just about everything else in the last few years. Philip – Well as far as I can tell, Autodesk can only buy things that are for sale, and so I take comfort in that! Sky, welcome back! Glad to see you’re OK and back at it. I always enjoy your posts. Question. On the first model there appears to be a fairly smooth transition between the body and the windshield. On the second its a sharp crease. It’s also showing also showing facets with 3, 4 and 5 sides. Does Rhino allow all of them or is it two models adjacent to each other? Thanks Billy! 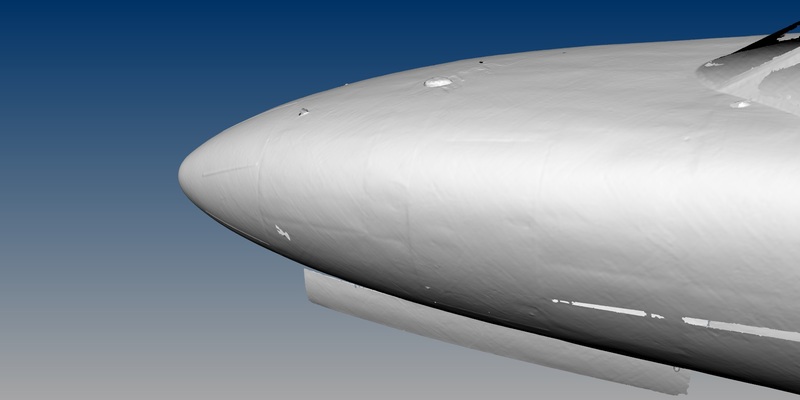 The actual aircraft has a pretty sharp break between the nose and windshield, as you can see from the laser scanned data. As for it being “fairly smooth” – I assure you if you looked at it up close it looks more like oatmeal. As for surfaces with 3 or 5 sides – ALL NURBS surfaces are “quad” in that they must follow a rectangular layout. Yes, you can force a rectangle into a triangle, but that’s where bad things start to happen. If you look closely at the isocurves of the bad model, you’ll see they are actually still all quad, but they have more than four surfaces meeting at one point in some instances. The overall point here is that the surface “layout” (where the surfaces are broken up, and how the points are aligned) is completely non-sensical, and leads to unusable models. This is but one example of this type of problem – one that I got permission to show, but I can tell you I’ve seen variations on this over and over and over…. One more point to make – if the client wanted to have a blend between the nose and the windshield, adding it to our model would be easy. On the other model, the blends are sort of “baked in” to the surfaces themselves – there is no way to take that model and tweak the transition between the nose and windshield. That’s another issue we see with models like this – by making the models from so many surfaces, doing any sort of editing to the surface is either impractical or impossible. I have been checking out SHAPE you’re are so right it is a very cool RE Tool I thought T Splines had some power full features. I would like to contact you out side of this forum by email is that ok! If so you have my email flick me a line.